After visiting the various sites located around the Golani Junction as reviewed in a previous post, I drove up north and turned onto Road 866 headed for Meron. I pulled over briefly at a roadside lookout to take this panoramic picture of the gently rolling mountains to the south and the Kinneret (or Sea of Galilee) to the southeast. Winding my way up the mountain I reached the entrance to Meron and pulled in, parking not far from the famous kever (grave) of Rabbi Shimon Bar Yochai, often referred to by his acronym Rashbi. From the parking lot I looked up at the majestic hillside ruins of Meron’s ancient synagogue, now marred by “Na Nach” graffiti. Inside the recently restored remains of the once great Roman-era synagogue I admired the architecture and layout, being built up against a rock wall. Perhaps the first to be built in what has become known as “Galilean” style, the synagogue’s construction is composed of a large room with two parallel rows of columns and multiple entrances on the southern side. 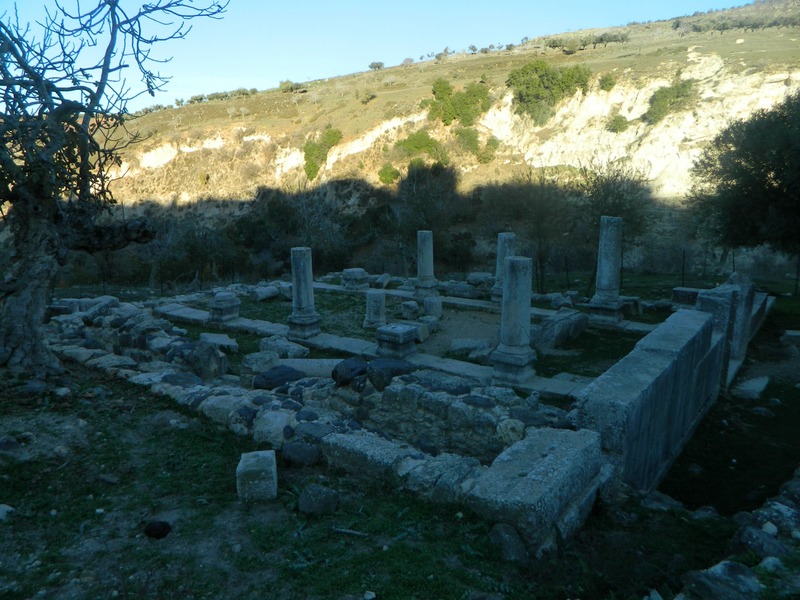 Built to service the large Jewish presence in the Galilee during the Roman times, the synagogue eventually fell to ruin and disuse after the military backlashes of the Great Revolt and subsequent earthquakes which collapsed most of the structure. Looking down the precipice to the north, I gazed upon ancient burial caves which I had already explored on a previous trip. Circling around the rock tower seen on the left side of the previous photograph, I found a way to climb up and reached the top in no time, gazing down at the world around me. 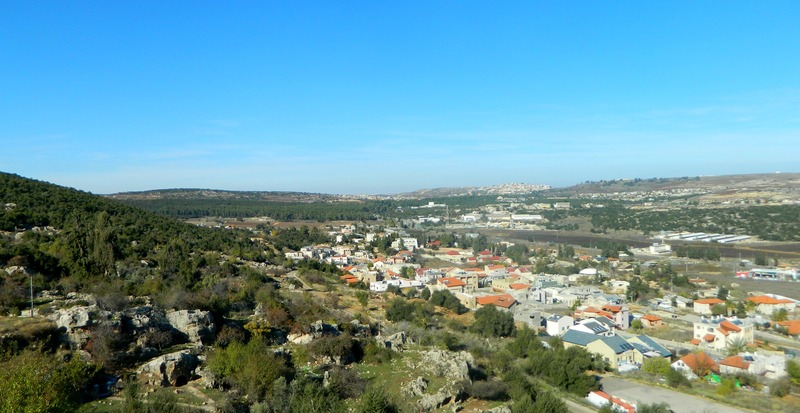 Below me was the ruins of the synagogue, the unseen Rashbi complex to the south and the sprawling houses of modern day Meron to the north (with the aforementioned burial caves visible in the lower left corner). Far off in the distance in the above picture is the mixed Christian-Muslim village of Jish (or Gush Chalav), the next and final destination of my trip for that day – but first, a visit to the kever of Rashbi and his son. 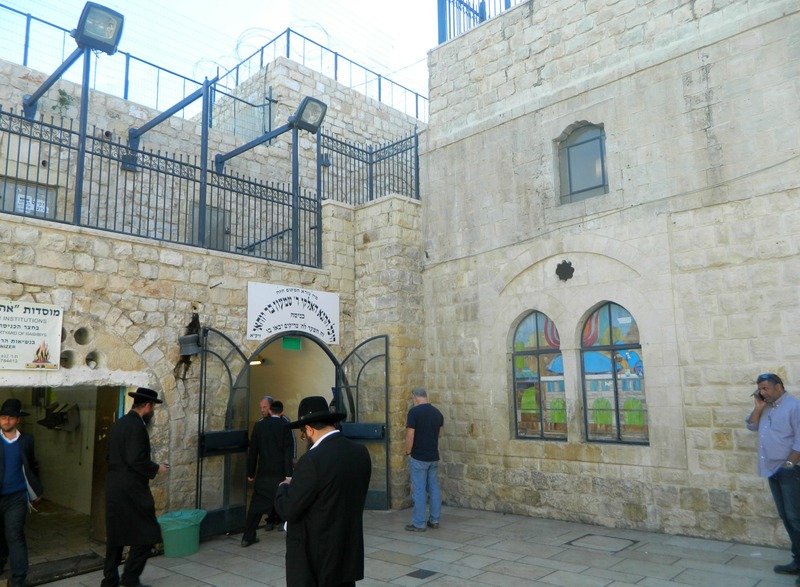 I had hoped to cover Rashbi’s kever in a post about Lag B’Omer, a Jewish holiday which is partially focused on Rashbi himself, but my last several attempts to attend had failed and so I report my ordinary daytime visit. 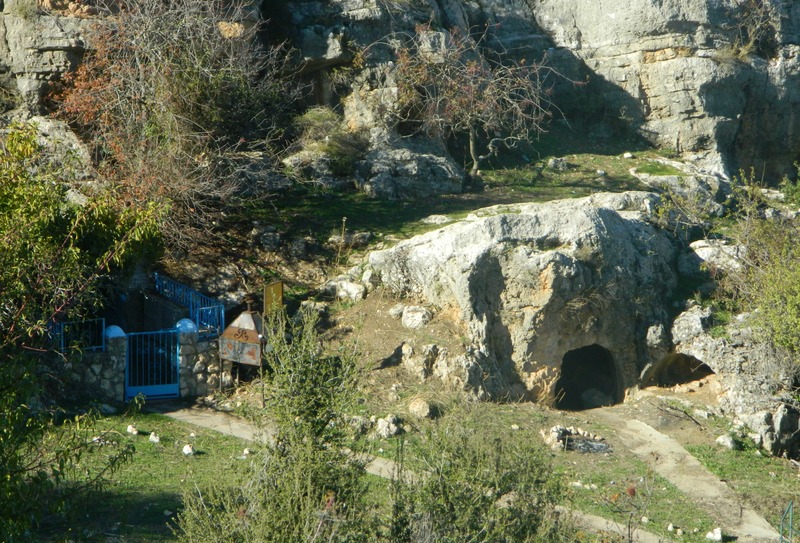 With an unending flow of visitors from both near and far, Rashbi’s kever dominates Meron’s renown, persuading many to list Meron as one of Judaism’s holiest sites. 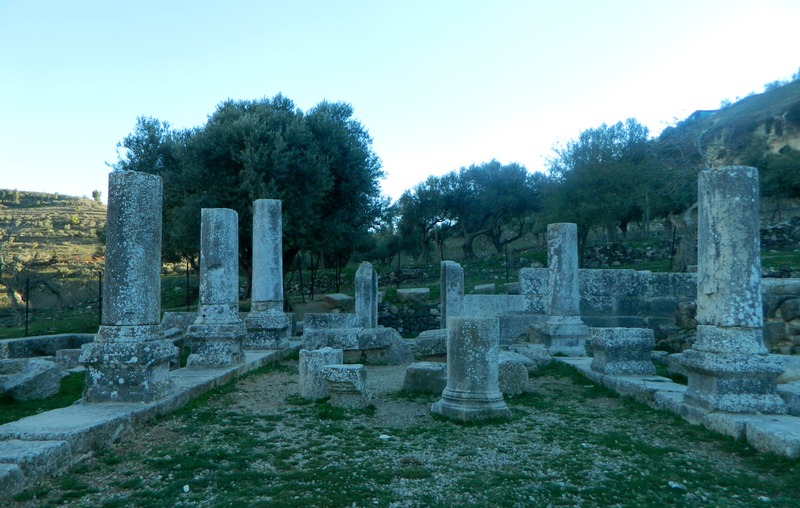 But there are dozens more holy graves literally scattered throughout the Galilean countryside, marked with iconic blue paint (Kabbalistically symbolic of protection against the evil eye), and I merited to give pause in reverence before getting back into my car. I had a delicious schnitzel baguette at the roadside Gallo restaurant and put the car into gear heading towards Jish (Gush Chalav). As instructed by my GPS, I parked precariously at the end of one of the nameless streets and disembarked. Gathering in my surroundings, looking around at the nonconformist houses with the sounds of Arabic “Jingle Bells” on loop floating in from the school down in the valley below, I started off on the trail to the final objective on my trip. 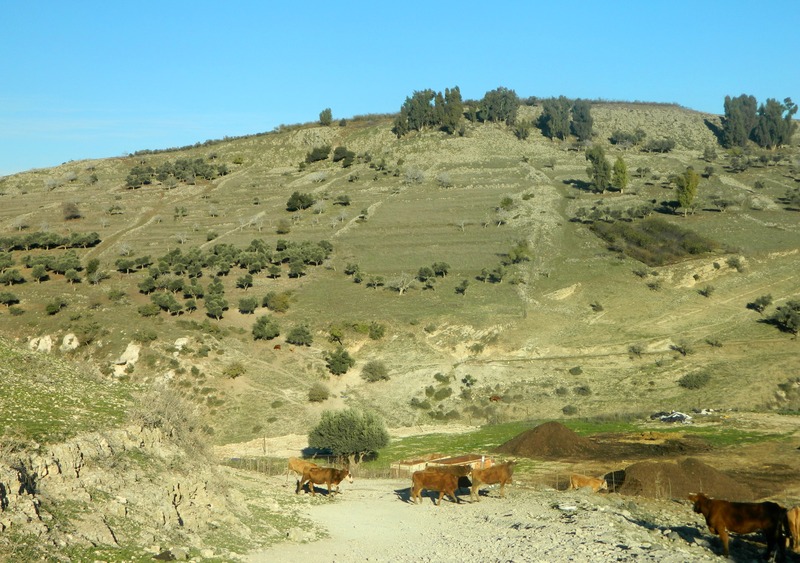 I was headed to the ancient synagogue of Gush Halav, and I was taking a marked trail that runs not far from a nearby streambed. I passed cows and goats, poked my head into a small cave to find a partially decomposed sheep carcass, and continued onwards. Entering an eerie shaded area with tall hillsides, dry gravelly ground and bare trees whose gnarled branches stretched out grotesquely, I gripped a large stick as I saw a motley pack of unkempt dogs making their way through the bizarre landscape up ahead. It was in this unlikely place that I came upon the fenced-off ruins of the ancient synagogue. Gush Chalav was an important walled city for hundreds and hundreds of years, having served as the final Jewish stronghold in the Galilee during the Great Revolt against the Romans. Titus himself marched on Giscala (the Romanisation of Gush Chalav) after the fall of Gamla in the Golan, demanding surrender and subsequently receiving it, thereby ending Jewish resistance in the northern regions. Jewish presence has been marked throughout the hundreds of years that followed until the Ottomans conquered the area in the 1500’s and the village was inhabited by Muslims. 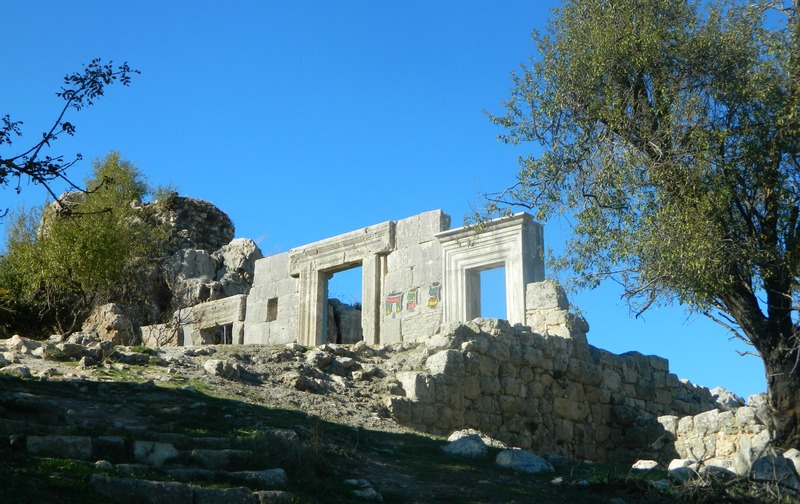 Druze refugees from the Lebanese mountains settled in the 1600’s but, after terrible earthquakes, the village was overtaken by a mixture of Muslims and refugee Maronite Christians from Lebanon as well (most of the Christians coming from nearby Biram, as mentioned in the Bar’am post). Gush Chalav’s synagogue was built nearly identically to the one in Meron, using the same basilica-layout that was made popular by Roman influence. With the sun setting and the long day coming to a prolonged close, I returned to the gravel trail and made my way back to the car and from there, back home.